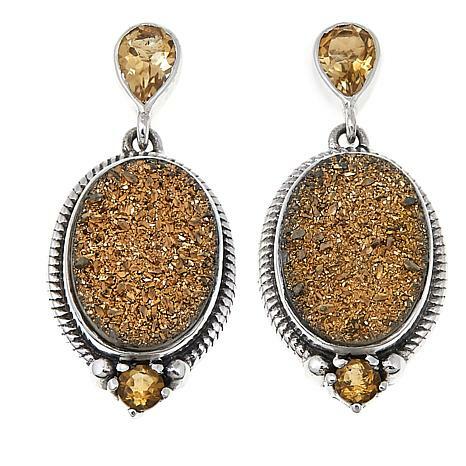 Just like your personality, the texture of the drusy catches light and radiates outwards. Magnificently paired with fine sterling silver details and complementary color gemstones, there's no place this accessory can't go. 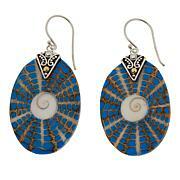 You and this earring pair? Looks like a match made in fashion heaven to us! 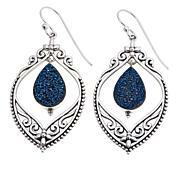 These are beautiful earrings. Love the color and they are the perfect size for every day wear - not too large and not too small. This is a great line of jewelry - I have been very happy with every purchase so far! Cool earrings. Great weight, and a Wow look! Sparkle like crazy! Love these. 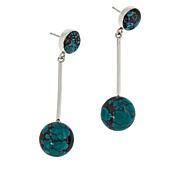 They are lovely and easy to wear (not too heavy). Highly recommend. I really like the design and size of these earrings however I had hoped it would have been more of an icy blue but it was more of a silver color. Perhaps instead of white topaz, if sky blue topaz were used, that might have highlighted the 'caribbean blue' of the druzy more, I don't know. I will be returning these as I already own platinium druzy earrings but because I like the design so much, I will purchase a different color.